Iraq’s Christians have paid a high price for the war. Prior to 2003, about a million Christians lived in Iraq, accounting for some 5 percent of the country’s 23 million people. But as violence intensified, reaching a crescendo in 2006, extremist groups began targeting Christians. Living in small pockets within predominantly Muslim communities, and without organized militias to protect them, Christians proved especially vulnerable. Moreover, extremists increasingly viewed Iraqi Christians as collaborators with the Western “Christian” occupying forces. Fleeing the sectarian violence that has engulfed Baghdad, Basra, Mosul and areas where Christians have lived for centuries, an estimated 400,000 of Iraq’s Christians have sought refuge in neighboring countries or further afield. Of the roughly half million who remain in Iraq, more than half are internally displaced, many having migrated north to the autonomous Kurdish region, which remains relatively stable. Now, of course, many Iraqi refugees are on the move again, fleeing the civil war in Syria. 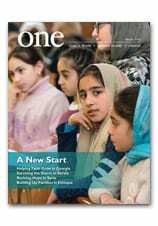 You can read more about them in two stories in the current issue of ONE: a look at Iraqis making a new home in Jordan and Syrians fleeing to Lebanon.